Variety Insight is a premium data and analysis solution designed for companies that require timely and accurate information in order to do business in feature film, TV and digital entertainment. A license to the service includes access to Variety Insight's entire list of features and includes email alerts. We appreciate your interest in subscribing to Variety Insight. Please fill out the following form and a representative will happily contact you at a day and time of your choice. Please note that all times are U.S. Pacific Standard Time. Feature Development - Search for feature films through all stages of development, from script pickups to post-production. 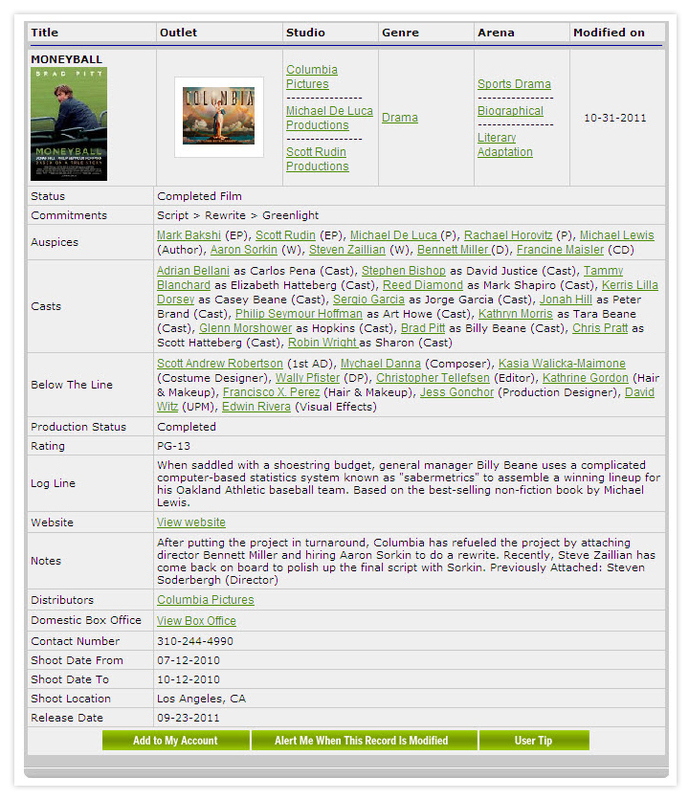 Completed Films - Explore our complete record of features back to 2000, including auspices, cast and production information. 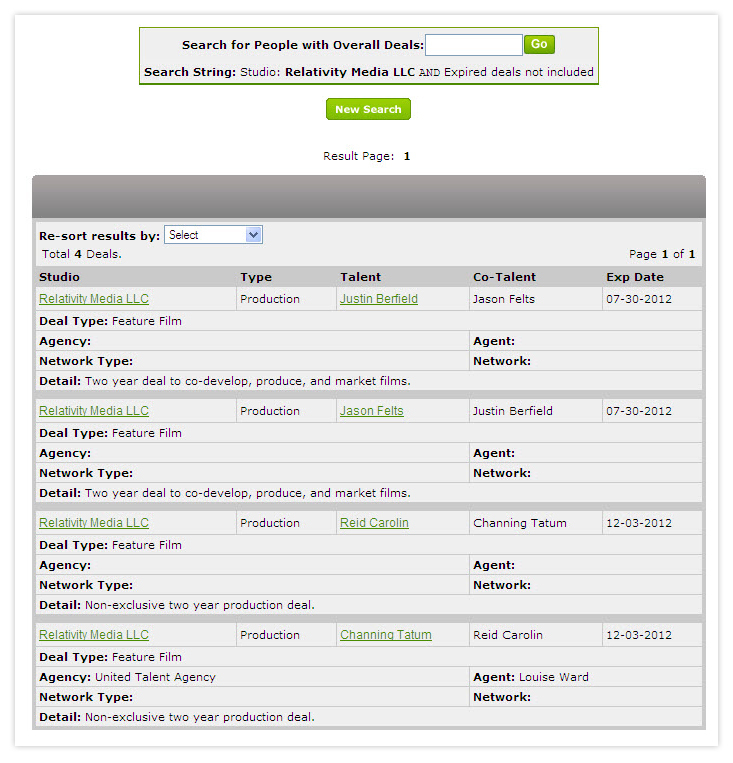 Production Deals - Production Deals allows users to search for all studio-level deals by the talent or agent attached. Film Releases - View our complete schedule of upcoming feature release dates. 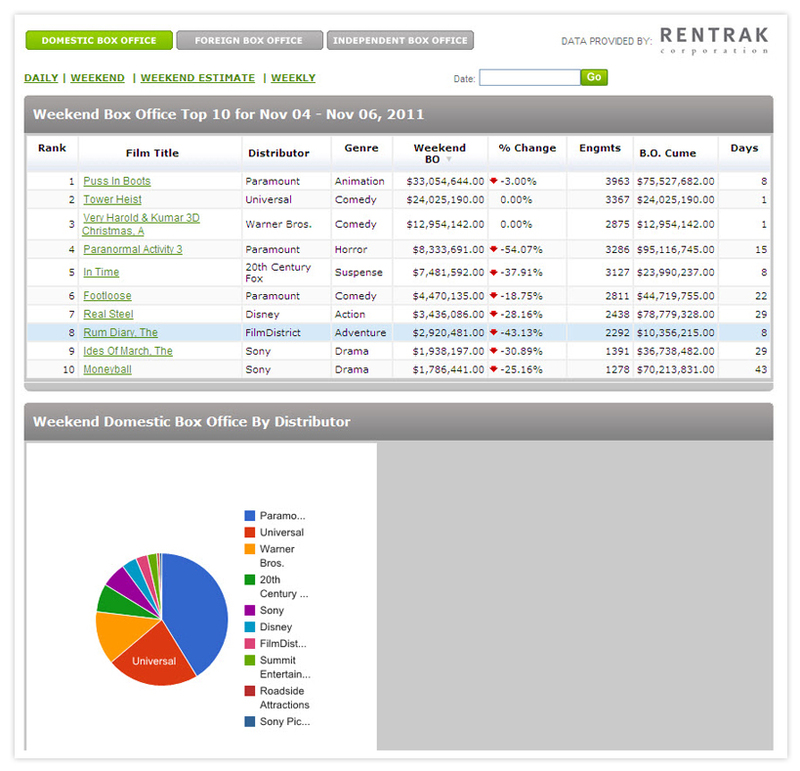 Box Office Insider - An in-depth listing of domestic, international and independent box office grosses, updated daily. Network Insider - The Network Insider allows users to browse the demographics, corporate makeup and development strategy at the broadcast and cable TV networks. TV Development - Explore the latest pilot and series pickups in broadcast, cable and syndication for the upcoming season. 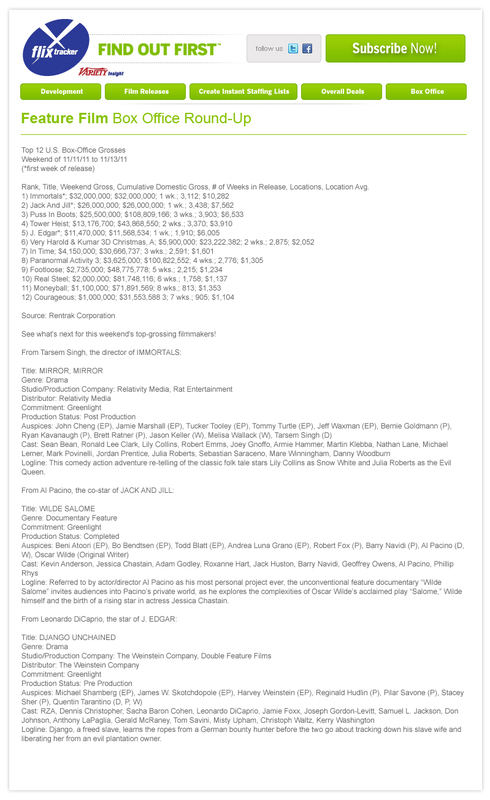 Overall Deals - Search a database of TV development deals at the top studios, organized by the attached talent or agency. TV Schedule - Programming schedules organized by day of the week or by network, tracking changes to the networks' lineups as the season progresses. 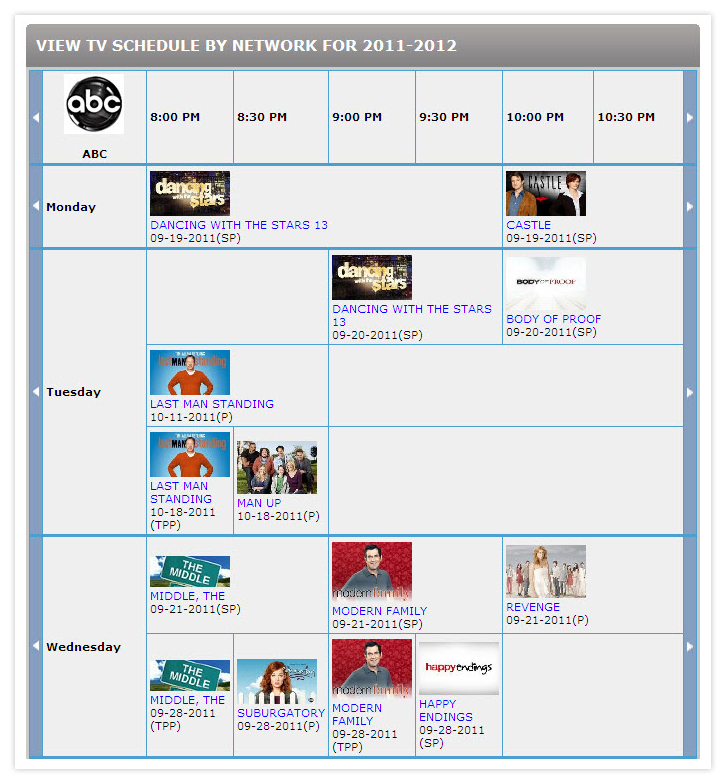 TV Premieres - A schedule of all upcoming new and returning series premieres on broadcast and cable TV. 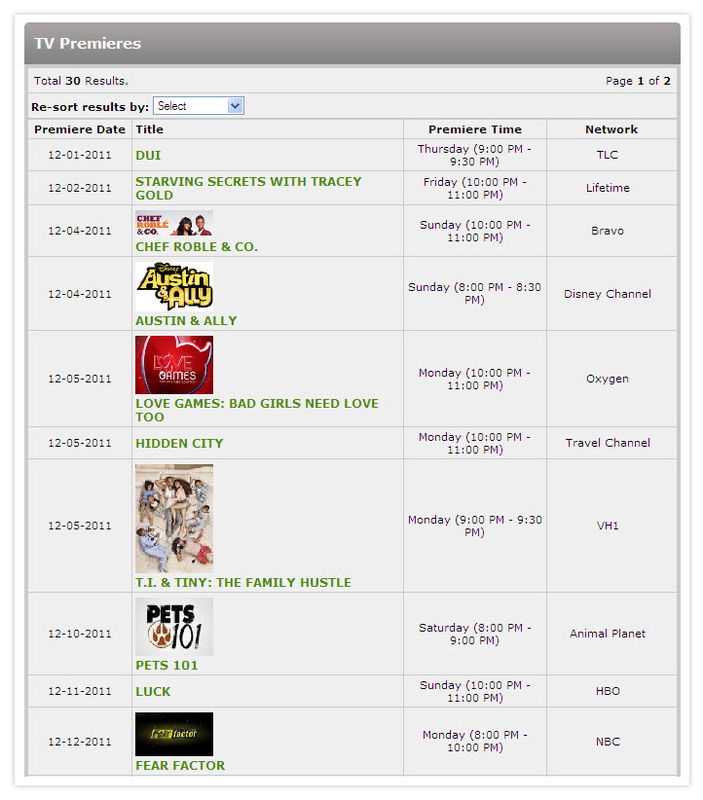 Daily Ratings - Household ratings for all the broadcast networks, updated daily with in-depth analysis. Digital Development - Track all upcoming digital programming from the leading digital portals. 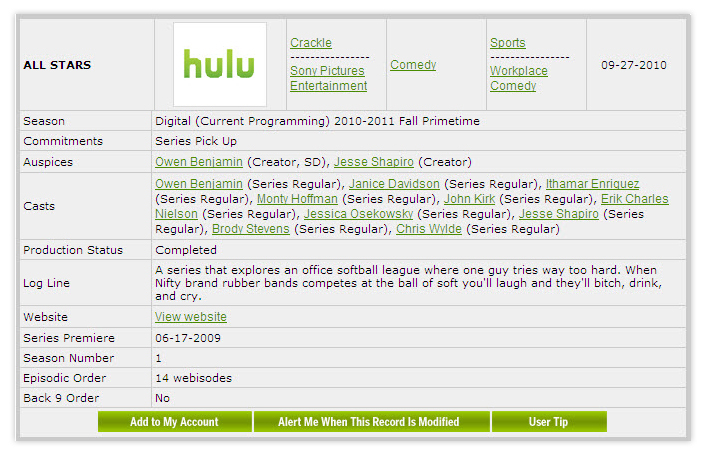 Current Digital - Explore our database of over 1000 current digital series at over 30 digital portals. Email Alerts - A complete database of all past e-mail alerts, including all pilot and series pick up alerts. Credits - The most accurate industry credits, including representation and work experience, for over 50,000 writers, producers, directors and actors. 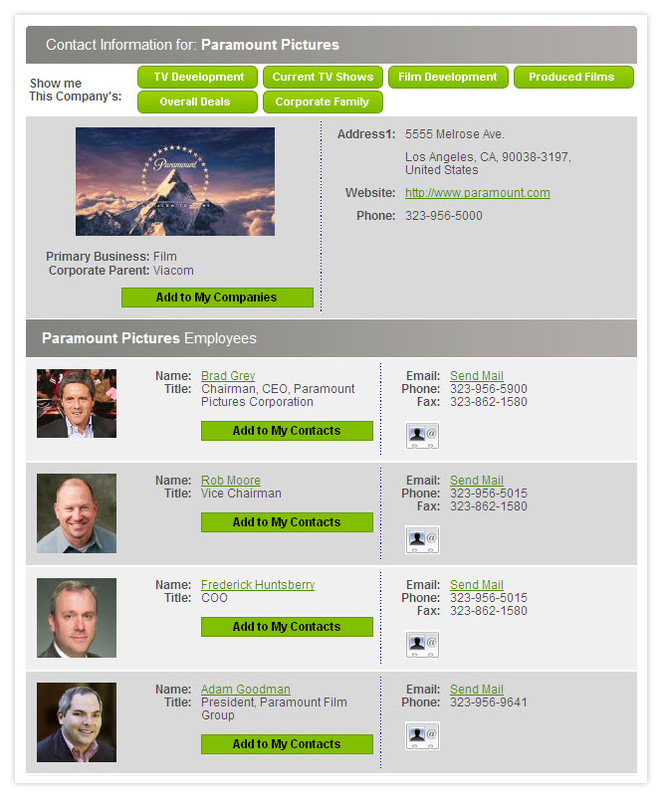 Exec Tracker - Exec Tracker provides a complete contact directory of studios, distributors, agencies and more. List Builder - Generate instant genre and pedigree lists of writers, producers, directors and more from film, TV or digital. Org Charts - The only service to provide a detailed overview of reporting structure for all the major studios, distributors and television networks. 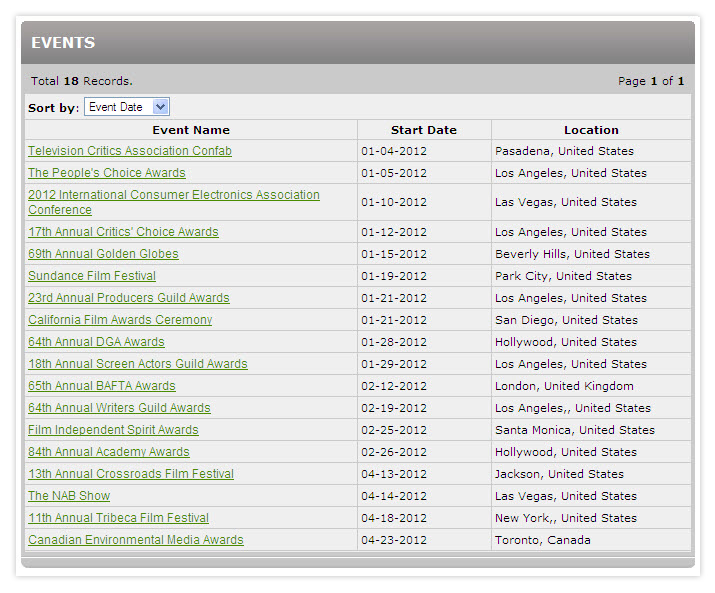 Awards - Check out complete lists of award winners and nominees in TV and film, from 2000 to the present. Events - A detailed schedule of upcoming industry events, including award shows, upfront presentations, festivals and conferences. With Variety Insight, users can track a feature development through the months or even years between a project's announcement and its final release date. As soon as a script is optioned by studio or production company, Variety Insight will list the project's information, collecting auspices, cast and company updates throughout development into production and completion. Variety Insight tracks over 150 feature distributors and hundreds more production companies, guaranteeing the user a comprehensive view of features as they develop. Variety Insight offers a full database of over 4000 completed feature films from 2000 to the present. 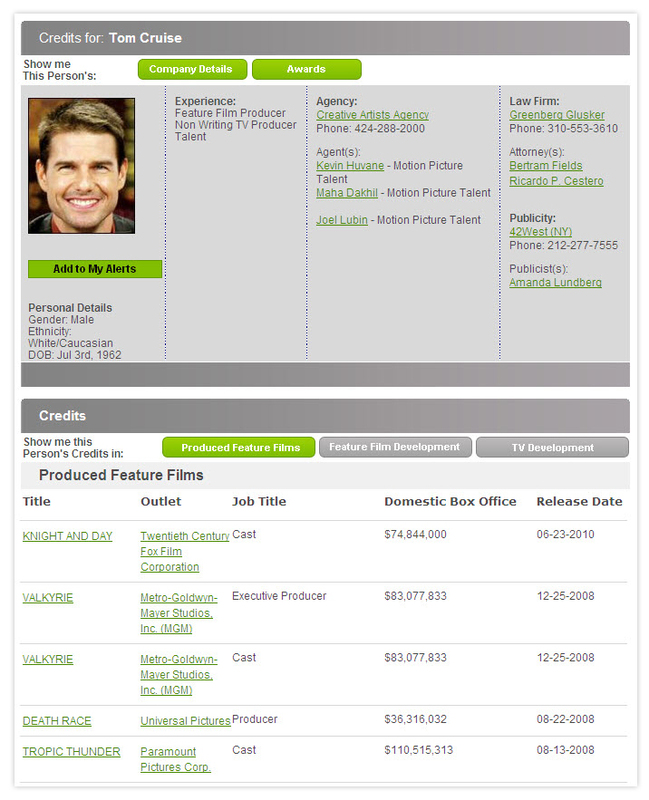 Completed feature film records allow the user to easily track the prior work of filmmakers and companies currently developing new projects, as well as access company contact info, complete above and below-the-line production staff, cast, shoot locations and dates, box office and budget, film website, additional platforms, and much more. Production deals are made at the studio level with A-list creative professionals and producers in feature film. Vertical integration encourages film distributors to develop projects with the talent already secured with their sister studio or production partners. Variety Insight's production deal listings identify the type of deal whether it be writing, producing, directing or talent, as well as when the deal expires and the responsible agent or manager. Production deals can be viewed by specific studios, as well as by the talent or agent attached to the deal. Located on the front page, this section identifies all upcoming feature films organized by release date, and include titles, studio, distributor and MPAA ratings data. 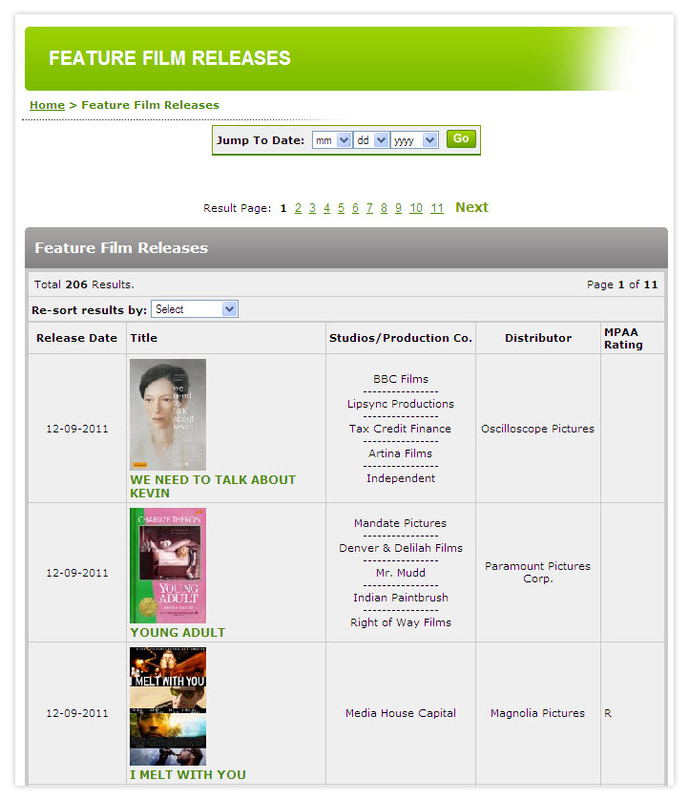 Users can jump ahead to future release dates, and clicking on any title will link users directly to the project page of the feature in question. The Box Office Insider offers extensive coverage of daily, weekly and weekend box office grosses for all domestic feature film releases. Additionally, all feature film records include breakdowns of their box office performance on day-by-day basis. The Box Office Insider also covers international box office by region, as well the numbers for independent releases only. Variety Insight analyzes the leading broadcast and cable networks on an on-going basis providing clients with the internal mandates driving development, acquisitions, programming and scheduling. The Network InsiderTM gives clients a comprehensive overview of each network's business model, branding, key demographics, signature series, corporate structure and more. The Network InsiderTM features the following information and analysis for each network. In addition to feature film development, Variety Insight and Variety Insight also offers users the ability to track TV projects long before a series makes the primetime schedule or a project is covered in the trades or industry blogs. Variety Insight covers development for over 70 of the leading broadcast and cable networks and nine of the leading syndication companies that produce original programming for television. Current TV program tracking allows subscribers to easily access timely and accurate data on over 1500 current on-air series across the leading television networks and distributors. Current show records include contact information for every company involved in its production and distribution as well as the following: complete production and writing staff, cast, episodic order, shoot location, schedule, production office phone number, series premiere, season premiere, season finale, production status, show website, additional content, availability for download and much more. Clients also have access to episode guides for all scripted and leading reality series in broadcast and cable television. 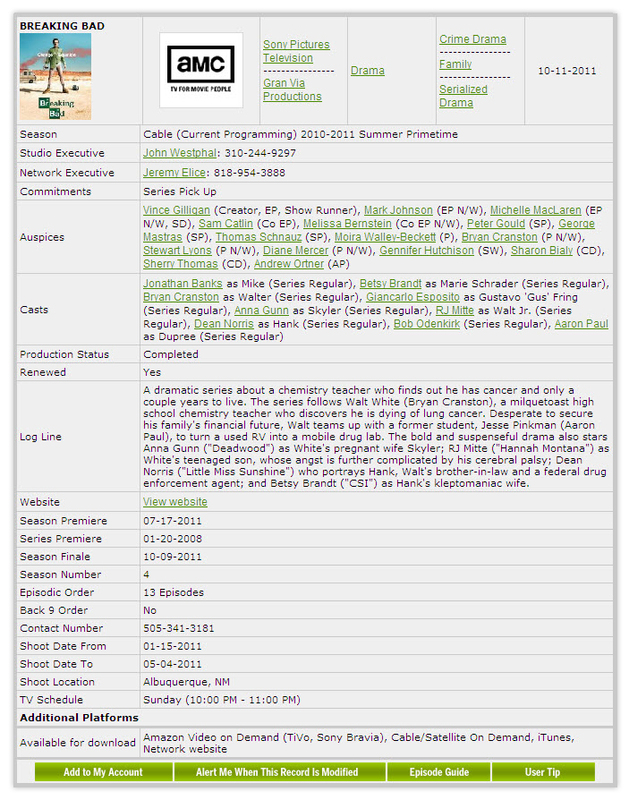 Each episode guide provides the following data fields: air dates, ratings, synopses, guest stars, directed by and written by credits and episode numbers. Clients have the ability to see very quickly and easily how a program is trending by scanning ratings data in a specific series' episode guide. 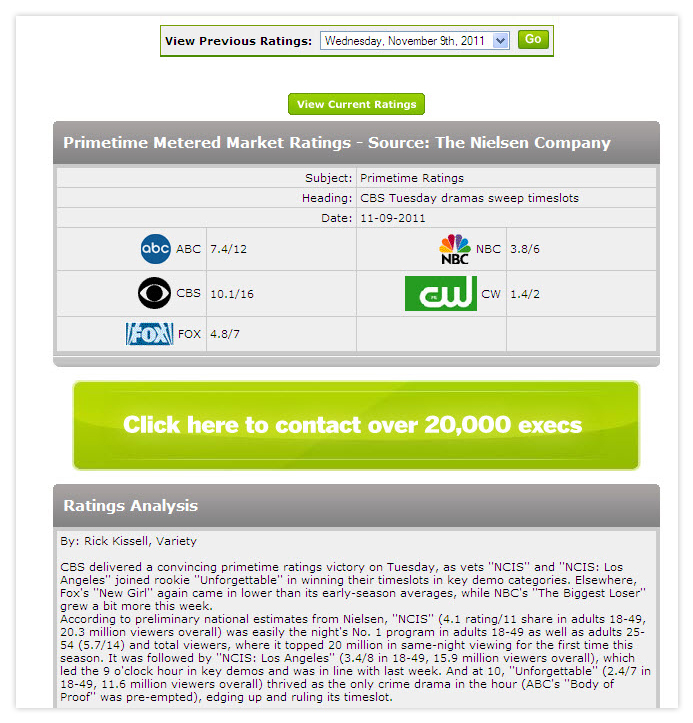 All ratings data appears courtesy of the Nielsen Company. 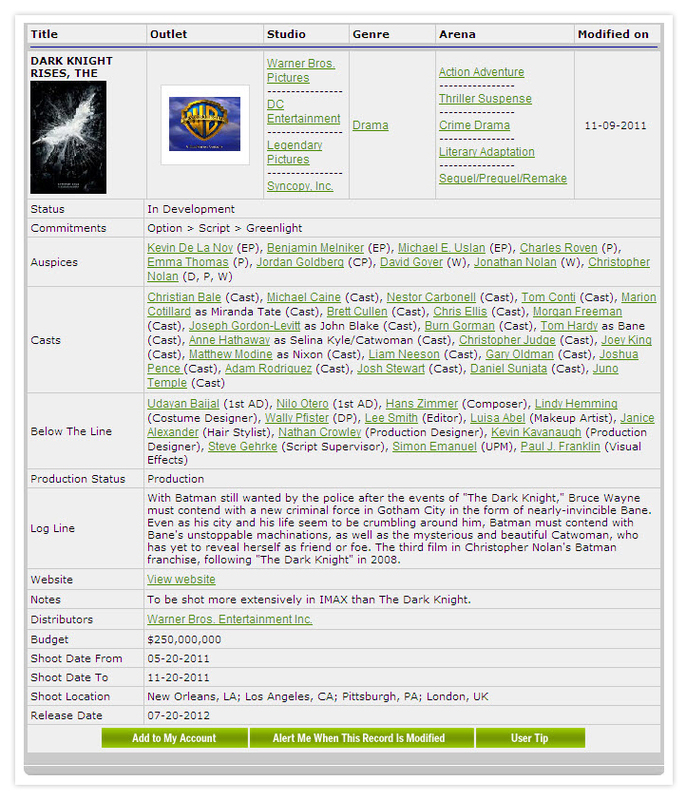 Overall deals are development deals made at the studio with A-list creative professionals and producers in television. Vertical integration encourages networks to develop programming with the talent already secured with their sister studio or production partners. Overall deal listings identify the type of deal whether it be writing, producing, directing or talent, as well as when the deal expires and the responsible agent or manager. The TV schedule allows clients to view the entire television schedule in broadcast and cable the same way TV programming executives do. The schedule identifies changes by time period and users can easily click on program and series titles for complete episodic, ratings and contact information. TV Premieres identify all new and returning programming before it premieres, ensuring that clients always know about the latest programming first. 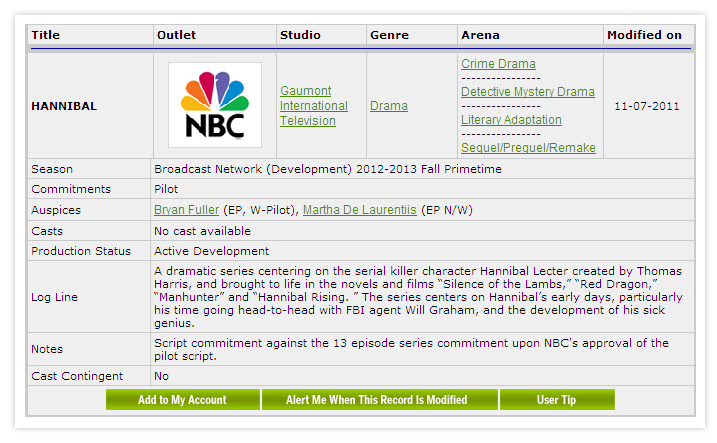 By clicking on any title users get complete details regarding each TV series or program listed in this section. Daily Ratings deliver primetime metered market ratings for the five major English language broadcast networks care of the Nielsen Company. This section includes a daily analysis, as well as identifying the 18 to 49 leader per time period across the broadcast networks. This section also includes an archive of daily ratings extending two weeks back from the current date. Variety Insight currently tracks over 1000 digital series and programs across the leading 30 online portals. Variety Insight excludes user-generated digital content, so all series in the database include production company information, episodic orders, and direct links to the portals, so that users can view the series directly. E-mail Alerts provide breaking development, executive and box office information directly to your Inbox. Alerts include the Feature Film Box Office Round-up, Movers & Shakers, and the Week in Preview. Weekly Feature Film Box Office Round-up recaps the box office grosses for the previous weekend and tracks the latest development projects from the industry's top-grossing filmmakers. Week in Preview alerts cover a full schedule of feature film releases, as well as TV premieres, finales and specials for the upcoming week. Never miss the next big hit in film or TV by reading this e-mail every Friday morning! Movers & Shakers is one of VarietyInsight.com's most popular services, detailing all the promotions and new hires across the entertainment business week by week. With Movers & Shakers alerts you'll be able to build meaningful business relationships with your colleagues who are on the fast track in entertainment by being the first to know who's been promoted or newly hired. Film Festival Round-ups cover all new distribution deals coming out of the top film festivals around the world, including Sundance, Cannes, Venice and Toronto. Variety Insight, powered by Variety Insight, provides the most accurate credits for virtually every writer, producer, director and actor working in filmed entertainment. Variety Insight includes the entire spectrum of a creative professional's experience in film, TV and digital entertainment, while also displaying their responsible agent, manager, lawyer, and publicist contact information. 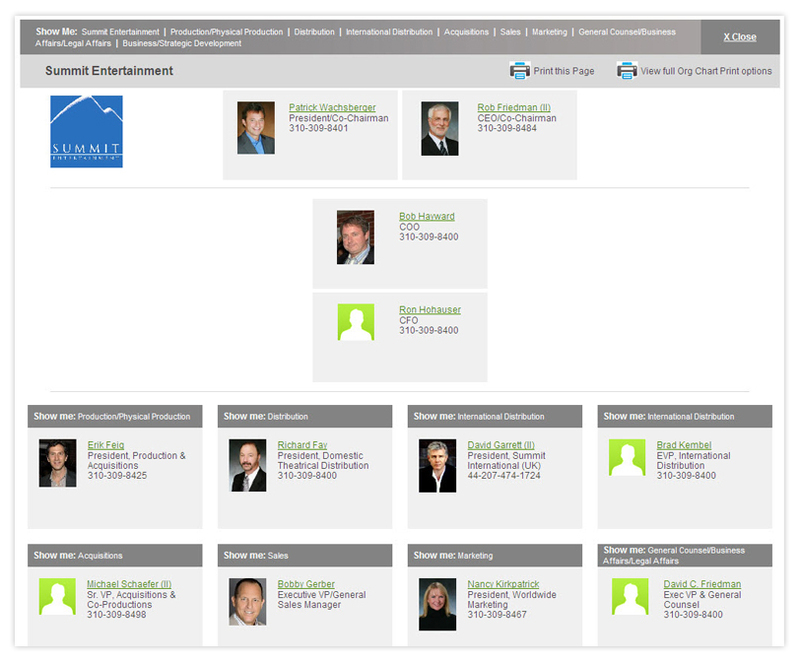 Exec Tracker is the most accurate directory of entertainment industry contacts designed for business professionals. Most listings of executives, agents and managers include title, address, phone, fax, email and photographs. The search interface in Exec Tracker allows clients to search by company, employee or business type, making it easy to find the right people right away. Every company in Exec Tracker features a complete list of executives, each clickable to see other companies where the executive is employed, as well as direct phone numbers, e-mail addresses and lists of clients. Exec Tracker also allows clients to easily view a particular company's development, completed films, overall deals and sister companies to make sure you know about your colleagues' business before you pick up the phone. Exec Tracker's company and employee pages are designed to be easy to read both on Variety Insight's website, and when printed for easy access on the go or in meetings. List Builder offers the user the ability to create customized and detailed staffing lists across any number of categories. This time-saving tool will generate lists of producers, directors, writers and talent based on genre, box office, representation, among many other categories. Org Charts offer a complete view of a company's internal structure, breaking down the major studios, distributors and TV networks into their various divisions (development, production, distribution, etc.). 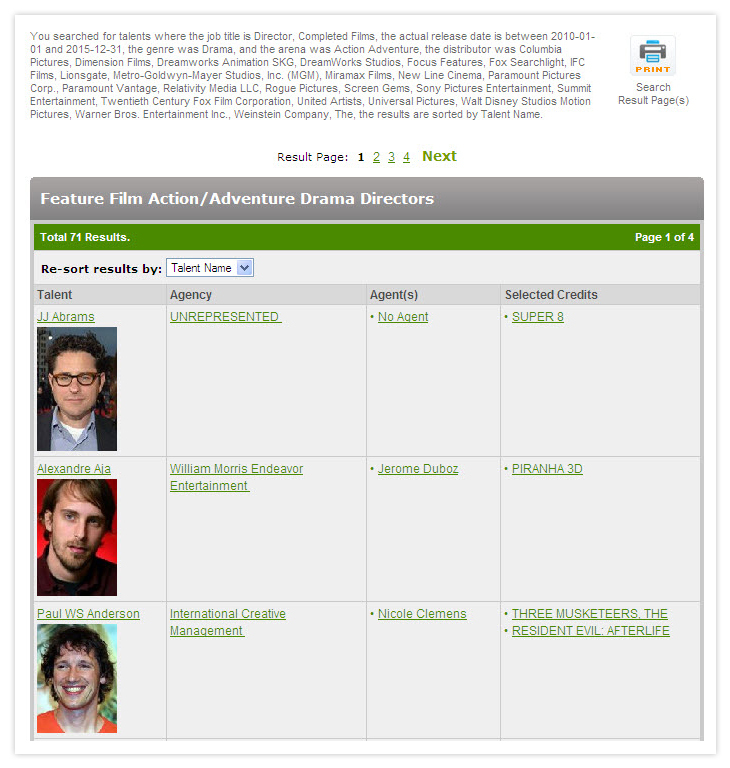 Org Charts point users in the right direction within the top feature film companies, connecting them quickly to the right executive for their business needs. Variety Insight includes a complete listing of all high-profile television and feature film awards from 2000 to the present, including the Emmys and Golden Globes. Awards can be viewed year by year through the front page of Variety Insight and all awards wins and nominations are listed with their associated talent and current programming records. Find any industry-related event from the Academy Awards to the Toronto International Film Festival quickly and easily by visiting the Events section on Variety Insight's front page. Events listings offer date and location information, lists of features appearing film festivals, as well as links to event websites.